The Good: Sports-car performance, sedan convenience, inspires Kobe Bryant-levels of confidence. The Bad: Not as fuel-efficient as the EPA would have you think, transmission a bit rebellious. The Verdict: A near-perfect harmony of speed, style and substance. The best automobiles are more than transportation appliances. Sure, they move you from place to place just as well as any car, truck, golf cart or Segway – but they do so much more. They inspire passion. They inspire lust. And, like Hugh Grant in any number of estrogen-tastic romantic comedies, despite their flaws, you ultimately come to love them wholeheartedly. The Audi S4 is one of those cars. On the surface, the S4 doesn’t seem very different from the A4 on which it’s based. While the S4 receives unique bumpers, a mildly different grille and quad tailpipes in lieu of the A4’s twin pipes, only the hardest core of enthusiasts are likely to notice. It’s a stealthy approach to speed – in stark contrast to the in-your-face aggression of potential competitors like the BMW M3 or the Mercedes-Benz C63 AMG. The trend of stylish subtlety continues inside, where the biggest variation from the A4 are a pair of sport bucket seats up front – though a handful of other differentiators, such as S4-branded gauges and steering wheel, pop up around the interior. 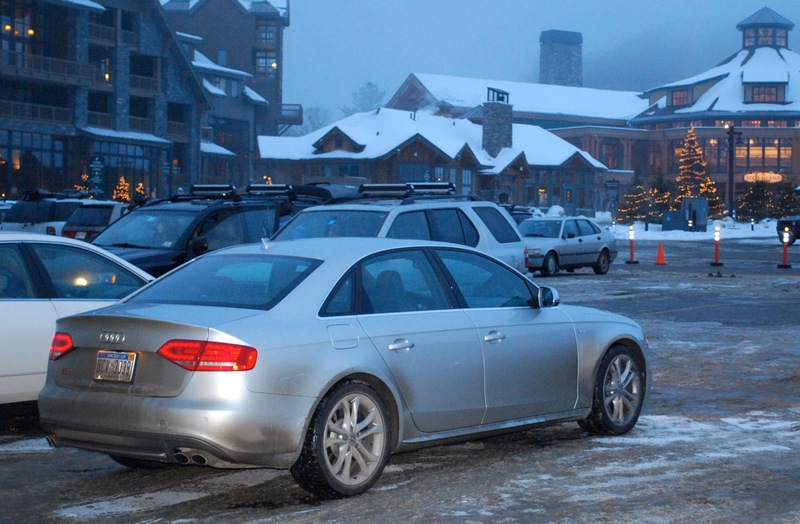 But lack of style was never really a problem with the A4 (at least from my point of view), and the S4’s differences, though minor, add a bit of panache to the car’s looks. Pop the hood, though, and the changes become a lot more apparent. Instead of the turbocharged 2.0-liter inline four-cylinder in the A4, the S4 runs wild with a 333-horsepower supercharged 3.0 liter V6 capable of propelling the S4 from 0 to 60 in 4.9 seconds, according to both Audi and Car and Driver. While the S4 is based off a front-drive platform (indeed, you can buy a FWD A4 if you really want, but good luck finding one), it thankfully comes with standard all-wheel-drive, which harnesses those gallivanting ponies and sticks them to the ground with the expected Germanic efficiency. Between it and the electronic stability control, even the slipperiest Vermont roads were easily negotiable. While a six-speed manual transmission comes standard, my tester put the power down through a seven-speed dual clutch transmission. In the past, I’ve been quite happy with this type of transmission (both in the Audi TT-S and the Mitsubishi Lancer Ralliart), and the S4 was no exception – in automatic mode, shifts are as smooth as a slushbox, while in manual mode, it cracks off shifts with Barry Allen speed. Adding a seventh, higher gear to the mix adds some virtue to the car’s hefty serving of vice, allowing the S4 to reach an EPA-claimed 28 mpg on the highway and 18 mpg in town. Of course, the EPA test cycle was designed by an engineer who drives like Ralph Nader in a snowstorm, so real-world mileage is a bit lower; I averaged 22.45 miles per gallon over a week of mostly highway driving. The dual clutch ‘box isn’t perfect, however. Even in manual mode, flooring the throttle in high gear causes the car to drop down several cogs to put you in the heart of the powerband again. In automatic mode, this certainly makes sense, but presumably any driver who’s enabled manual mode wants to make his or her own decisions – and if he/she wants to, say, test top-gear acceleration along the New Jersey Turnpike without being unexpectedly flung towards the Pennsylvania state line, that’s his or her perogative. Less startling but more annoying, the aluminum paddles on the back of the steering wheel are on the small side – small enough to be all but invisible behind the spokes at 9 and 3 o’clock. I presume this was an intentional move to keep them out of the way for drivers who don’t want to be bothered with shifting for themselves – but it seems kind of a burn to the enthusiasts who, presumably, make up a hefty percentage of the S4’s clientele. Quibbles aside, the S4’s powertrain makes for one hell of a fun ride; luckily, when the road turns curvy, the suspension and chassis proves more than capable of cashing the checks the supercharged V6 loves to write all over the pavement. 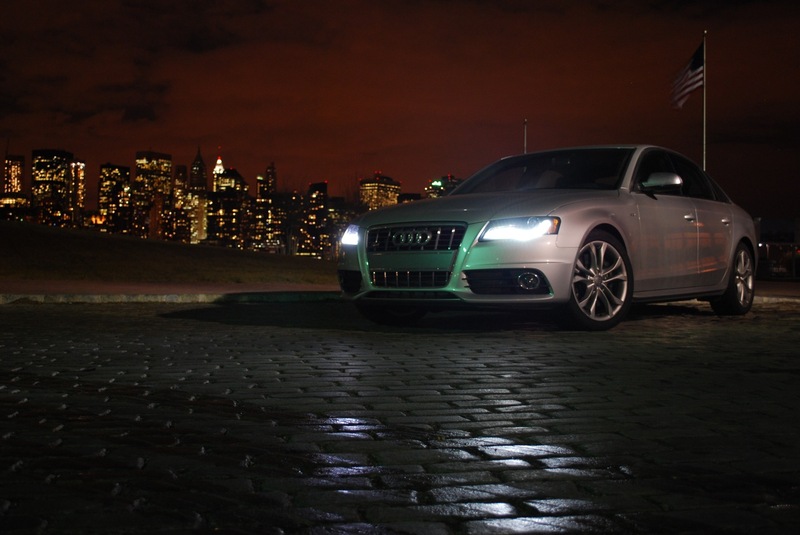 As with true sports cars, the S4’s limits will almost always lie beyond those of your nerves (at least on public roads). Push the car into turns, and it urges you on, encouraging and emboldening you. While the steering can be heavy at low speeds, it lightens up as the car builds velocity, never feeling floaty or disconnected. 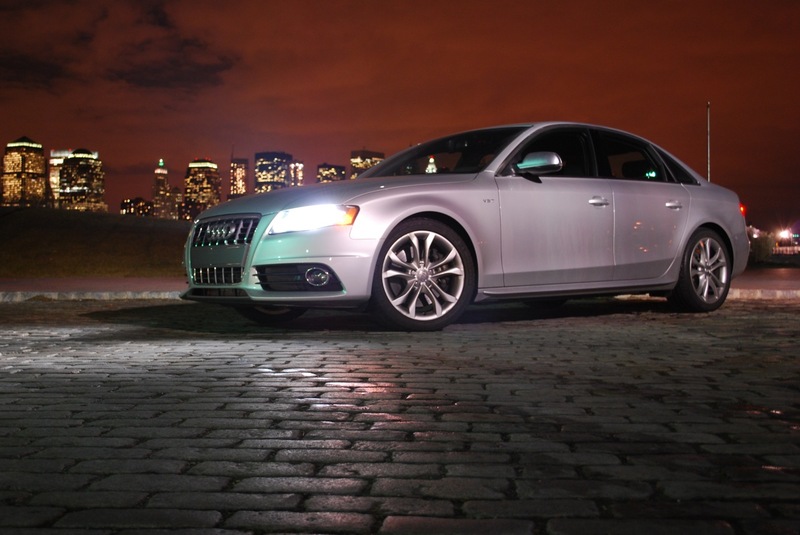 Few cars instill as much confidence in their drivers as the S4 does. On a side note, this was the first Audi I’ve tested lacking the Audi Drive Select system, which allows the driver to adjust the suspension, steering and drivetrain’s responsiveness. To what degree the ADS improves non-“S” models, I’m still unsure, but given my experience with the S4, I’d be hard-pressed to imagine how the system could improve on the car’s dynamics – at least, not enough to warrant its $3,950 price. 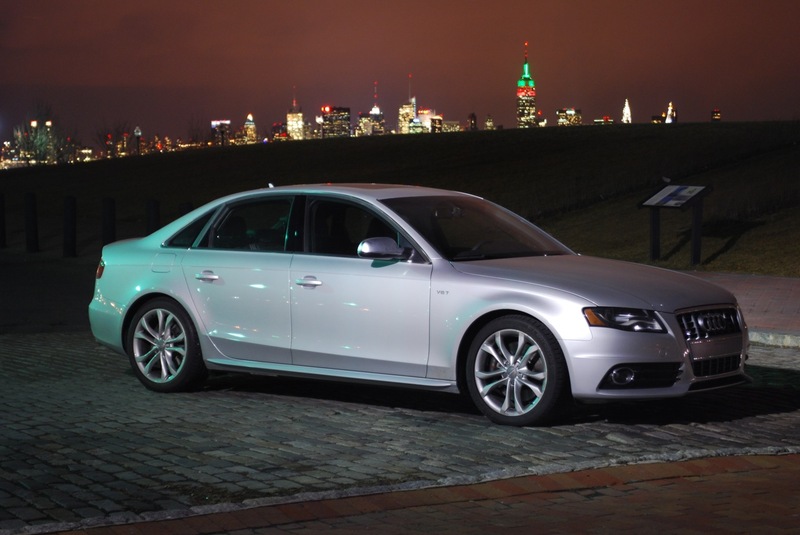 For anyone seeking maximum driving excitement for around $50,000 without sacrificing utility, the S4 is as good as it gets. It’ll take winding back roads like a sports car at noon and let you drive octogenarian ladies to and from dinner at night. 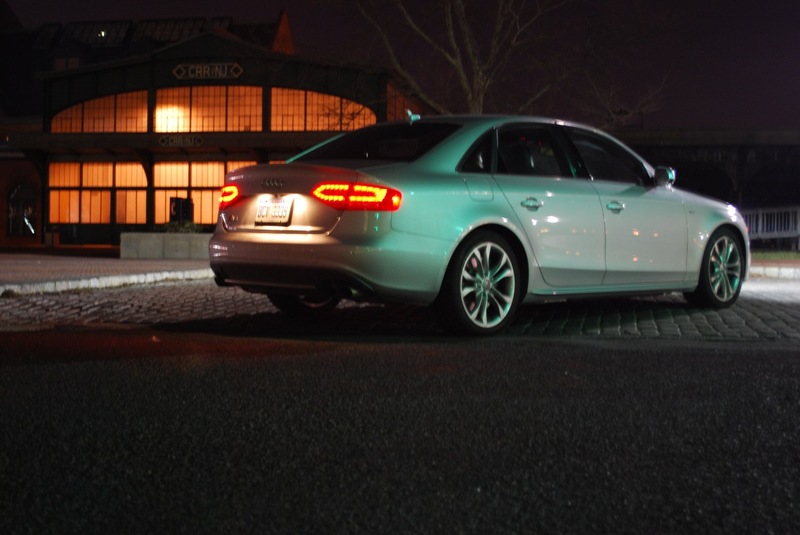 The S4 packs 95 percent of the fun of a sports car with 100 percent of the comfort and handiness of a four-door luxury sedan. As an automotive journalist, people often ask, “If you could have one car, regardless of price, what would it be?” Usually, I’ll respond with my supercar crush du jour, then offer a quippy remark about the fun factor overwhelming the little inconveniences – crappy gas mileage, hefty insurance rates, lack of room, tricky behavior in town, and so forth.